“Big Man Camp” featuring Kevin Love of the Cleveland Cavaliers demonstrating the high side and low side scoring series from the T-Post position. 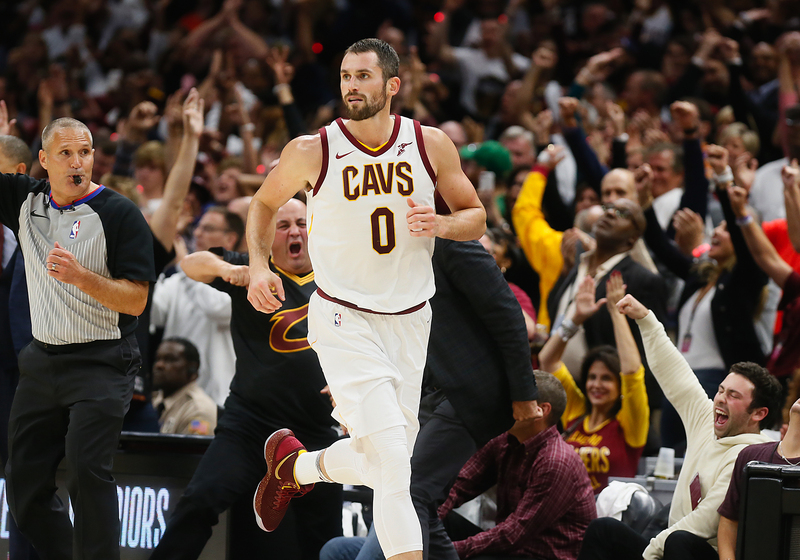 Summer is basketball camp season and below is a virtual “Big Man Camp” featuring Kevin Love of the Cleveland Cavaliers. In this series of videos, Love demonstrates moves from both the “High Side” and “Low Side” scoring series from the T-Post position (perpendicular to the lane line and the post defender’s chest). Love’s repertoire is a bit more finesse than the subject of our previous Big Man Camp featuring Steven Adams. While Adams often uses his size and strength to go through the defender and get to the middle of the floor, Love uses footwork and skill to go around the defender. Enjoy these videos with volume up to get the full Big Man Camp experience! There are times when the player from the T-Post position will not be perfectly parallel to the baseline on the catch. One foot may be closer to the baseline or further up the the floor. In the first series of videos, Love establishes as his pivot foot the foot furthest from the baseline – the high foot. In the High Side Series, the player first threatens the middle. In the video below featuring the High Side And Go move, Love pivots around the high foot and sweeps the ball through quickly to attack the middle and go around the defender. The High Side And Go move sets up the High Side Jab Jumper featured in the video below. The threat of going middle and an aggressive jab step sits the defender down in a stance. The defender believes Love will drive middle. Love is then able to step back into his jumpshot. These moves being with Love establishing his lowest foot – the foot closest to the baseline – as his pivot foot. They become the inverse of the High Side Series as now the first threat is to the baseline and the counter takes Love to the middle. In Low Side And Go, Love simply sweeps the ball through and drives baseline. In Low Side Jab Jumper, Love sweep fakes and jabs to the baseline then comes back to his jumper. Lastly, in Low Side Jab Baseline Go Middle, Love fakes the baseline drive then attacks middle. All three of these moves are featured in the video below. As a bonus, here are two videos of Love demonstrating a few moves from the Get Middle series featured in Big Man Camp: Steven Adams. These are examples of Love going through the defender rather than around them as with the High Side and Low Side series. Below, Love goes with the jumpshot rather than the jumphook when gets to the middle of the paint. Check out #ModernBigTips on Twitter for more on skills Modern Bigs should acquire! Also check out this Post Moves Teaching Tape!